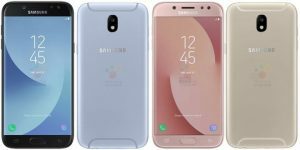 The Galaxy J7 (2017) to feature a 5.5” and the Galaxy J5 (2017) 5.2” display. Both device will be running on the latest Android 7.0 Nougat with Samsung’s custom UI on top. The Samsung Galaxy J7 (2017) has splash resistance (IP54). It’s have 1080p screen (5.5”) and a 13MP shooter with a dedicated flash. It uses a modern USB-C port.